Our Managing Director Lisa Grießer plugged straight in the final phase of the study “International Real Estate Management” at the Danube University Krems. Now – with special expertise – she can accurately respond more to various issues and problems relating to residential and commercial properties and customers with advice and assistance. In the summer she could prevail with their project group against the other participating teams in the development of a concept for a property in the municipality “Wilhelmsburg” in Niederösterreich. The performance was so convincing that resented with both representatives of banks, the state of Niederösterreich and the Danube University Krems, as well as the owners of the property. After that they became the “Project Development Award 2014”. 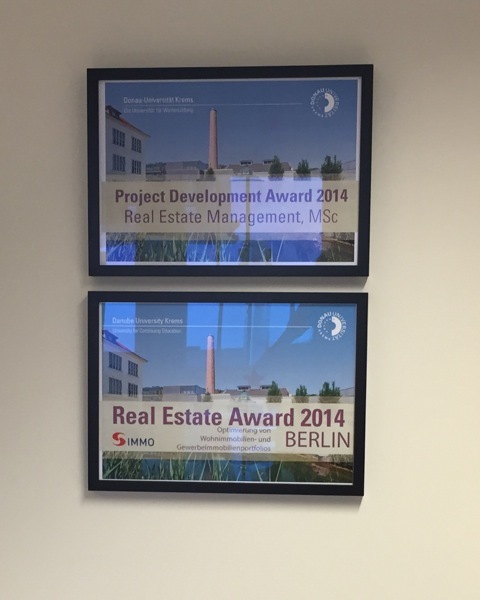 In November, the CEO and founder of real estate network Seefeld was able to score one more time in Berlin. In the optimization of residential and commercial real estate portfolio of S-ImmoBank the “Real Estate Award 2014” could be put pride back home. New ideas for the expansion, renovation or decoration as well as an entirely new use of existing real estate liked the directors so well that the first place and thus the price and also a considerable prize money to be made. So something is happening in “Immobilien Netzwerk Seefeld”. You see, we always continue learning for you. In the near future “Immobilien Netzwerk Seefeld” is also dealing with the new marketing strategy home staging. The aim is here to get objects more quickly to the man / woman. But more of that shortly.